Here we are already in mid-October with Halloween fast approaching and piles of pumpkins in the shops. A great incentive to cook some delicious PUMPKIN RECIPES FOR BABIES – so they can join in the Halloween fun too! Pumpkins are not only brilliant for making spooky lanterns to decorate your house and garden but they are also delicious to eat. Pumpkins make a wonderful puree that can be used in both sweet and savoury recipes. They are full of vitamin C, potassium and beta carotene rich too. Simply roasting pumpkin results in a wonderful silky texture which adds a luxurious element to soup and puree that both children and adults love. Roasting and steaming pumpkins are the best way to retain their nutrients and it’s easy too. A good age to introduce your babies to pumpkin is 6 – 8 months. My favourite ways to prepare pumpkin puree are either roasting, steaming or simmering. 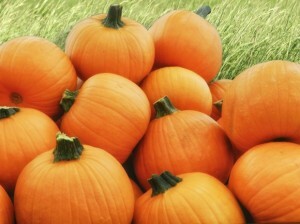 To steam or simmer – prepare your pumpkin by peeling, removing the seeds and cutting into cubes. Cook on a low steam or simmer for 20 minutes or until the pumpkin is soft. Drain water and mash or puree. To bake your pumpkin, cut it in half, de-seed and then cut into 4 – 6 large wedges. Place the wedges on a baking tray and bake at 180 for 40 minutes – the pumpkin is ready when a knife passes through the flesh easily. Scrape out the pumpkin flesh with a spoon and then mash or puree it. And some yummy savoury recipes too, simply add …..
Have a wonderful time with your little pumpkins!